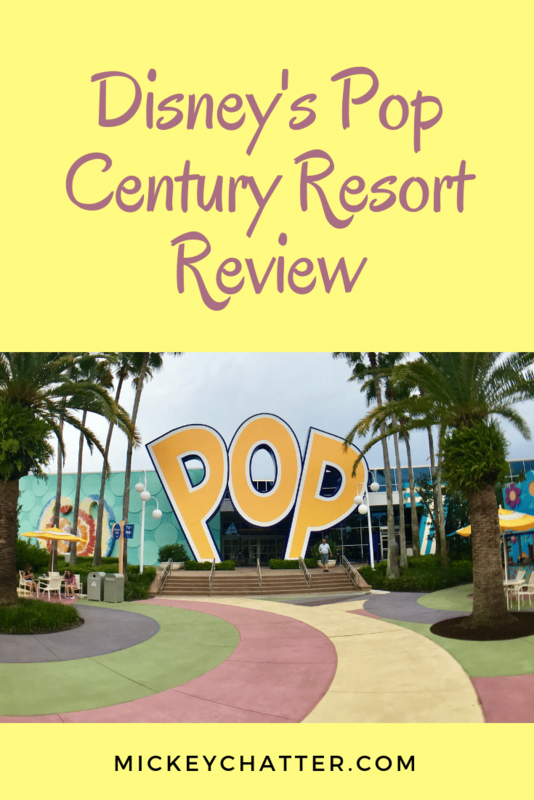 On my last trip, I returned to my favourite value resort – Pop Century! It’s my 4th stay at Pop and this time I got to experience it with the renovated rooms. 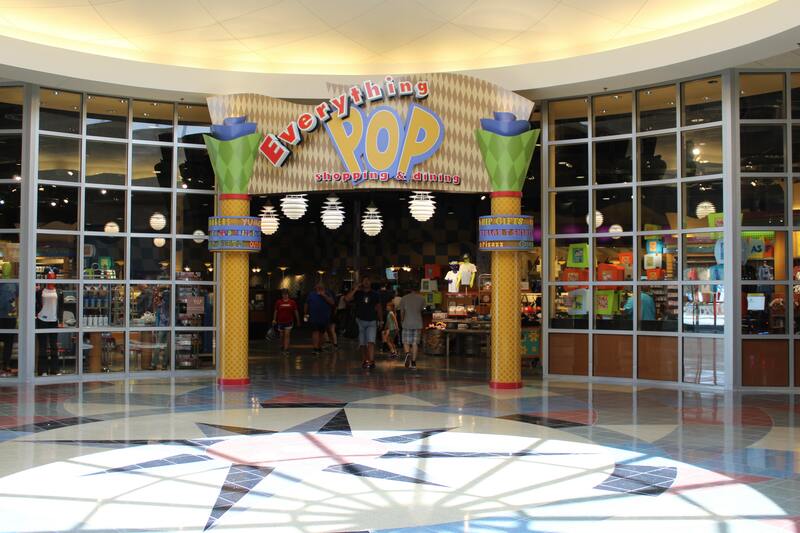 Pop Century is a little pricier than the All-Star resorts, so it’s not the cheapest on-property, but you still get great value for your money. The price range is generally around $120 USD to $175 USD per night, depending on the time of year you visit. 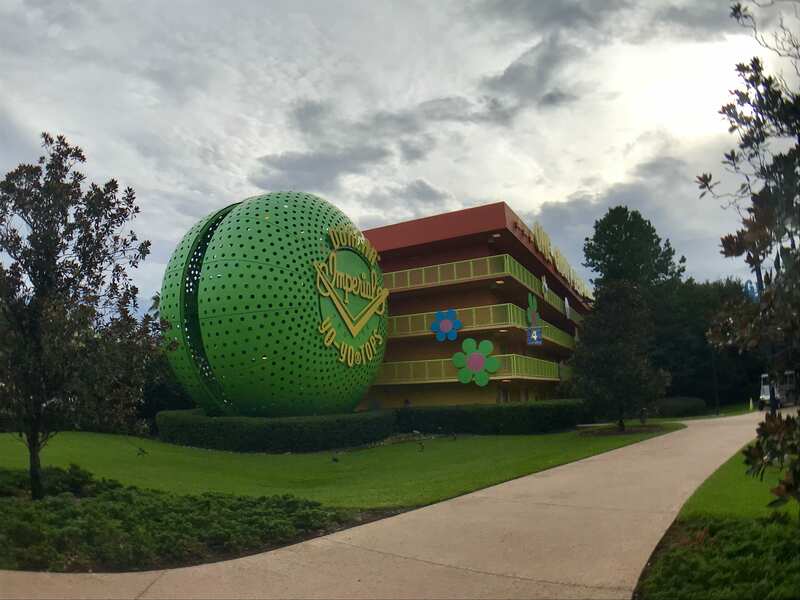 It is also located right next to Disney’s Art of Animation, so you can easily visit that resort if you’d like with a short walk over the bridge that connects the two properties. 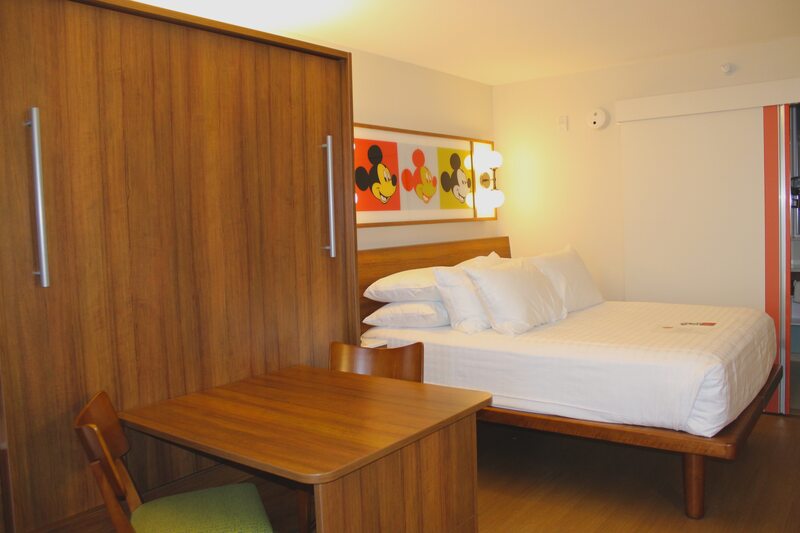 Let me give you a full review so you can get a clear picture of what to expect when staying at Pop Century. We arrived at the resort pretty early – around 11:30 am. Our room was not ready yet, so we opted to go straight to the food court to have lunch and wind down a bit after our flight. After lunch, we went to check-in, but our room was still not ready. If you’d like, you could leave all your bags with luggage services and head straight to a park, but I wanted to wait for our room. 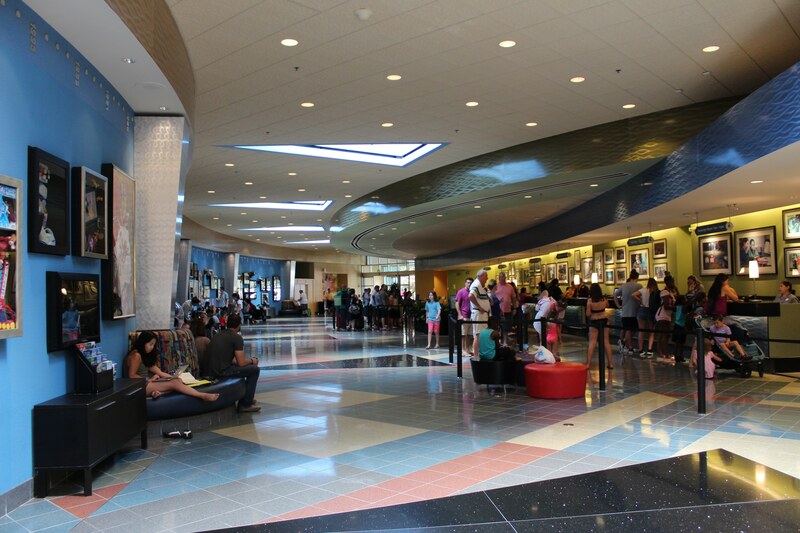 We hung around the lobby area and outside the food court. They have tables outside, so you can just sit and relax there if you’d like. By 1:30 pm, I went back to see if our room was ready even though check-in time is 3 pm. I have had many times where my room was ready early, so I thought I would give it another shot. At first, the cast member told me the room wasn’t ready. Then she consulted with someone that seemed to be a manager and was able to find a room that was ready that we could take. We were in the 50’s section facing the Bowling Pin pool and I was really happy with that location. We also asked about the promo offer if we forego housekeeping and they are still offering it. In exchange for not using housekeeping they gave us an $80 gift card for our 9 night stay. We didn’t really miss the housekeeping and just had to call a few times for refills on toiletries and to get fresh towels. 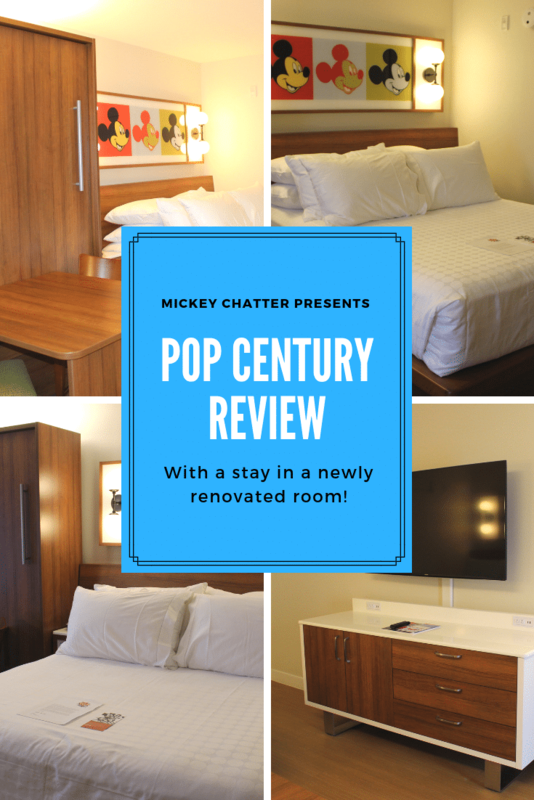 This was the first time we got to experience the renovated rooms at Pop Century and I have to say I am really impressed. I like the style they are taking with the new renovated looks of their rooms. While the decor is all updated, my favourite change is the floors. No more carpet! It just feels cleaner because who knows what lurks in those carpet fibers, ew! They have also improved the size of the beds. 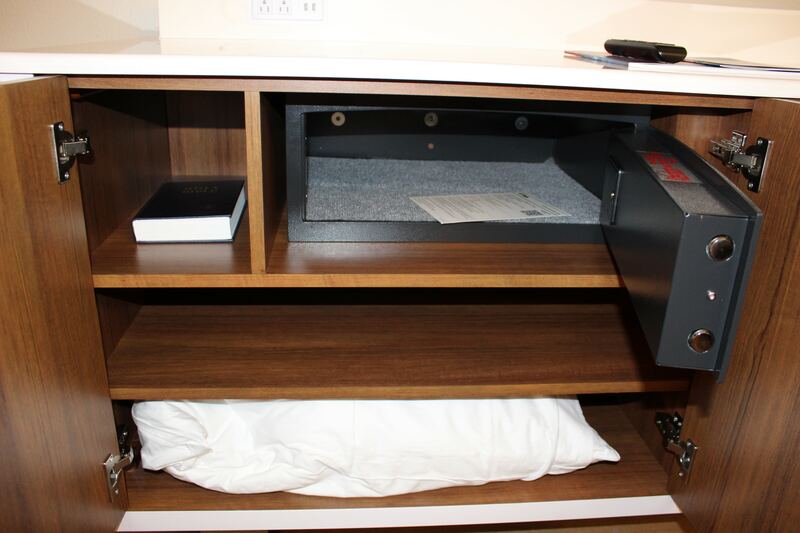 Previously they had 2 double beds, but you will now find 2 queen beds, one of which is folded up in a murphy bed. When you fold up the second bed, there is a table with chairs area that you can use. We didn’t have any use for the second bed, so we left it up the whole time, but I imagine it could get really squished in the room if you have both beds down all the time. I like the concept, but the negative is that you have no table if both beds are down. We now have coffee machines in the room, so if you need that caffeine fix in the morning, this is great news for you! They provide some coffee, tea, sugar and creamer for your convenience. I really like the “kitchenette” area, it allows you to organize and keep all of your food items together in one place. I also like that the fridge now has a glass door so you can easily see what is in there. I find there is a lot more storage in the room, especially in the bathroom area. They added a lot more shelving and the design now makes a lot more sense. Lots of area to keep your toiletries without having the sink area jam packed with stuff. They have new plugs that accommodate USB charging. 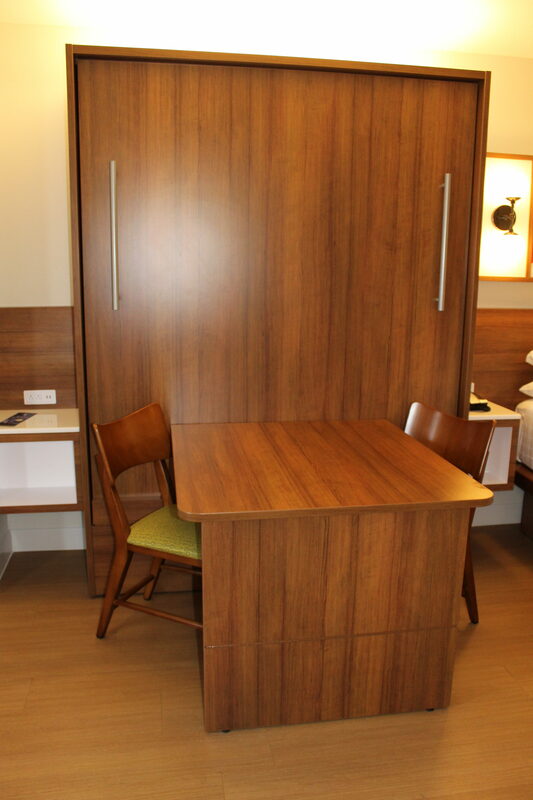 They have also changed the safes in the room, so you can now fit a laptop in it and a lot more than you could before. All in all, I am really happy with the changes they made to the rooms. It seems like they addressed everything that was wrong with the value rooms previously. Hopefully, the All-Star renovations will follow a similar suit. The resort sections are designated by decades, from the 50’s all the way up to the 90’s. Each section represents their own decade with fun theming. The 60’s and 50’s are the designated “Preferred” areas as they have rooms that are closest to the main lobby building. 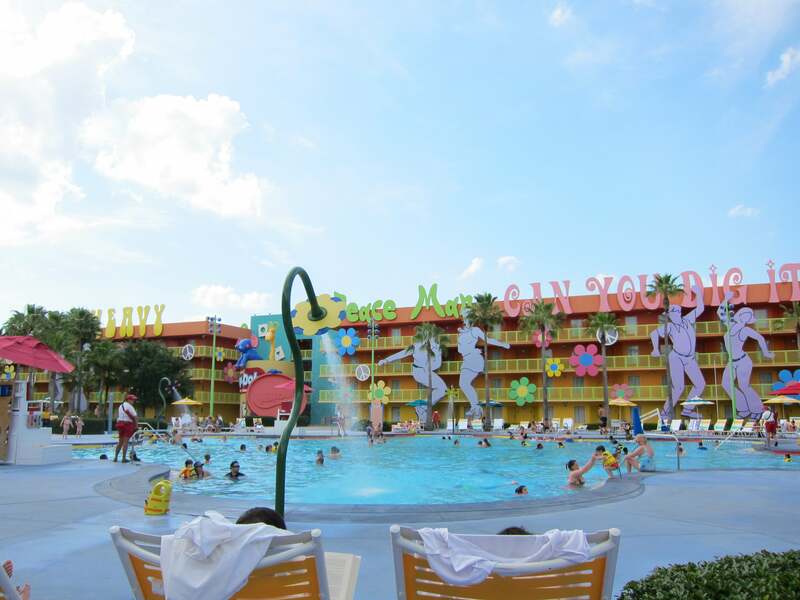 If you want to stay near all the action, then you will want to request the 60’s section as that is where the main pool is located and most of the resort activities take place there. I find the furthest areas are the 80’s and 90’s, but if you want to be in a quieter area of the resort, then you may want to consider requesting those sections. Overall, the property is a bit larger than an All-Star resort, so there is a bit more walking, but it isn’t too large. I find the size just right and it never feels like a very long walk to the main building. Aside from the 3 pools and the main lobby area, the resort also has a playground for children in between the 70’s and 60’s section. There are 3 pools at Pop, with the main one being the Hippy Dippy Pool in the 60’s section. This is the loudest pool and where you will find most of the action. The pool is shaped like a flower and has flower themed spouts around the pool that have water coming out of them. The kids really like that aspect, so they can run under the water spouts. They also have a baby pool area right behind the Hippy Dippy pool for younger kids. You’ll also find “Petals”, the poolside cocktail bar right outside the main lobby next to Hippy Dippy. In the 50’s section, you’ll find the Bowling Pin pool, which is shaped after its name. The pool is pretty basic, no slides or water spouts, just the pool. It’s also a lot quieter than the Hippy Dippy pool. There isn’t really a lot of shade around the pools in general, so you will be out in the sun most of the time. They have loungers and some tables with chairs. The table and chairs have an umbrella, so those will be your only chance of some shade. Make sure to get to the pool earlier if you want to grab a table & chairs with shade. 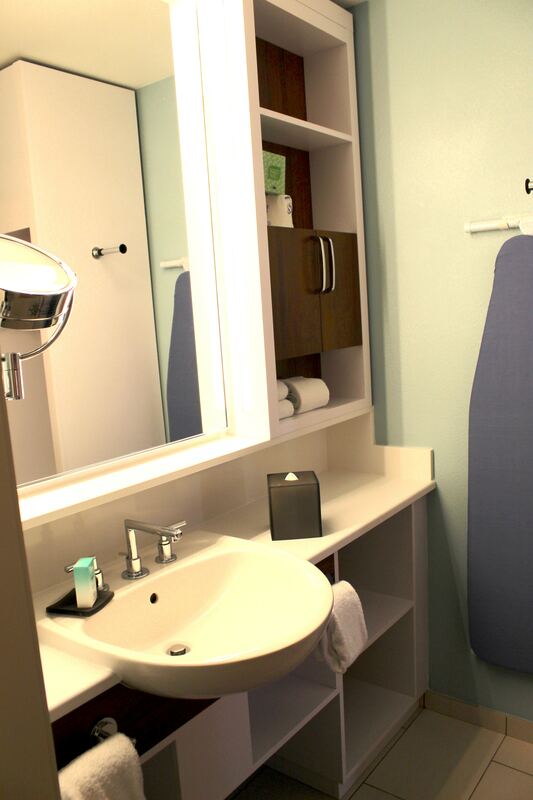 The pool also provides towels, which you can then drop off in the towel bin when you are done with them. The 3rd pool is in the 90’s section and it is a Computer themed pool. Again, it is a quieter pool since it is not centered around the main area of the resort. If you want some quiet time, this may be the place for you. 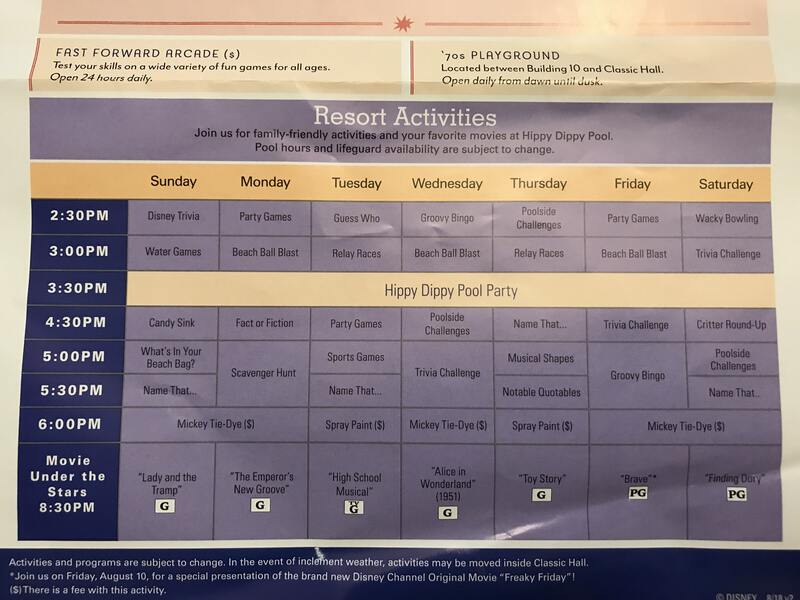 The resort provides you with a Recreation Calendar when you check-in to see what is happening throughout the days you are there. In the afternoon their animation team is usually out by the pool running fun activities for the kids. They also have a ping pong table right outside the main building and a hair wrap/henna station. They also have a great arcade in the main lobby building. You can get an arcade card for any amount you’d like and then you just swipe it to play the games. Great for when you plan to spend an evening at the hotel and are looking for some entertainment. They also have a great gift shop right next to the food court if you would like to do a little shopping. Lots of fun Disney merchandise to choose from! I always enjoy the selections of food at Pop Century. They really do have something for all tastes. If all you want is burgers, fries and pizza, then you will find that there. But they also have options like pot roast, turkey dinner, chicken parmesan, veggie sandwich, chicken salads…. the list goes on and on. I always find there is a wide variety to choose from. The food court does seem to be the hub of the resort, so it is often busy. If you can eat during the off-peak times, then it won’t be as loud in there. 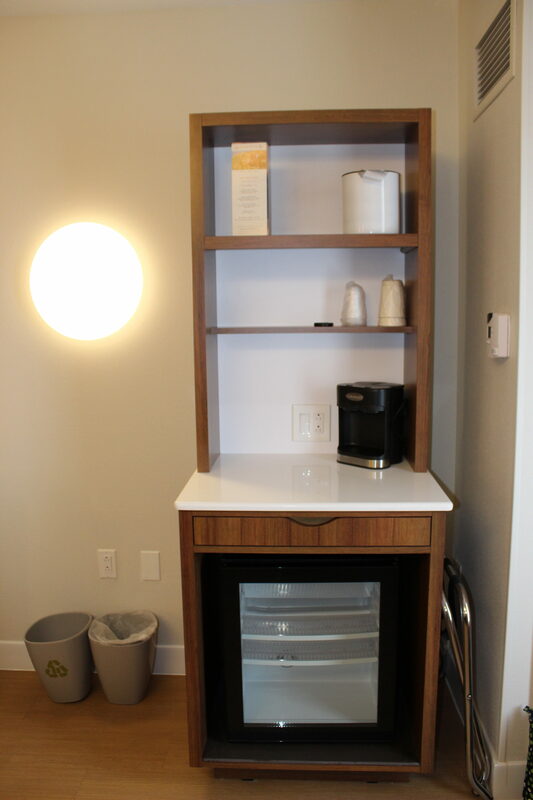 They have several beverage stations where you can use your refillable mugs. I’m not a big soda drinker, but I really enjoyed the variety of iced teas I could get. They had one that was called White Iced Tea with Citrus Flavour, and it was delicious!!! With your refillable mug, you can get soda, coffee, tea, iced tea, hot chocolate and water. If you don’t have the dining plan, then you can purchase a mug for $18.99 each and it is good for the length of your stay. The only form of transportation from Pop Century are the Disney buses. I find they always came quickly and you can now check on the My Disney Experience app when the next bus is coming. I found the app was always very accurate and it was nice to know how much longer until the next bus, better than standing there never knowing how long it will be. The only complaint I have about the bus stops is that there is no shade. I wish they would put up some kind of shade since sometimes you are standing in line in direct sun, and it’s Florida! Next year, Pop Century will have an additional form of transportation – the Skyliner. 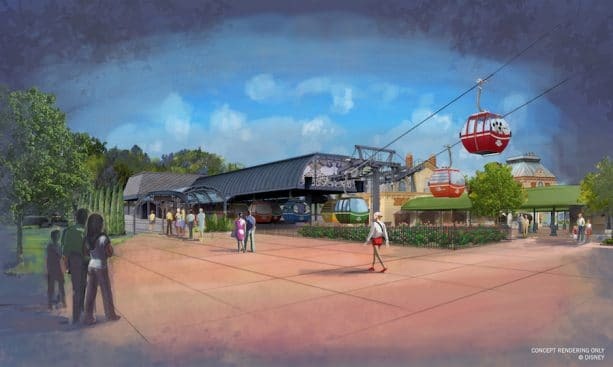 This is a new gondola system that Disney is constructing and there will be a station at Pop Century. The Skyliner will take guests to Hollywood Studios and Epcot. You can also use it to visit two other resorts – Caribbean Beach and the Riviera (new resort coming in 2019). I am super excited to see how this new form of transportation will pan out and if it will help make the Disney buses less crowded. PreviousPrevious post:Cheap Eats at Disney WorldNextNext post:New Disney Canadian Resident Ticket Offer Announced!! Should You Stay At A Disney Resort or Not?